Don't need the stress of you doing your own bookkeeping each month? Do you dread the mountains of invoices and receipts each month? If so, let us help! 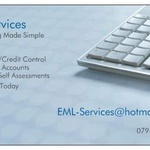 We pride ourselves...Read moreDon't need the stress of you doing your own bookkeeping each month? Do you dread the mountains of invoices and receipts each month? If so, let us help! We pride ourselves on being able to provide Accounting Solutions for your business which are both inovative and easy to implement as well as maintain. At EML we specialise in removing the time, stress and worry associated with your companies daily bookkeeping, releasing your time to concentrate on the more important aspects of the business, such as driving your company forward. Our expertise and experience covers a wide range of business sectors. Why not let us help you understand your business sector better. Whether you are a sole trader, partnership or a limited company, we have accounting solutions and helpful expert advice available for you. Summary: I am currently employed as the sole accounts manager for a Market Research Company in Central London, turnover approx £3 Million. I have worked in accounting positions at lower and higher level in the following industrys doing general bookkeeping, cash handling to more advanced techniques such as trial balance and budgeting and cash flow forecasting.